You want to make sure that DOT requirements for road markings are easily met in an economical way? You want to ensure that road markings stay perfectly visible in times of increasing numbers of ageing drivers and the advent of smart driving and autonomous vehicles? Then SWARCO offers you the right system solution. 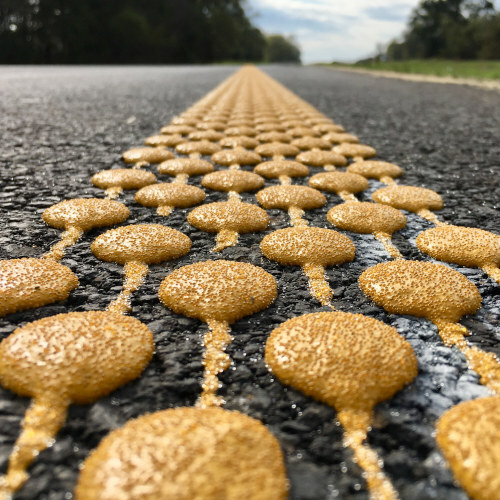 To provide an economically responsible solution to Texas DOT spec SS8999 “High Performance Pavement Markings with Retroreflective Requirements”, SWARCO has come up with a structured marking system consisting of SWARCOTHERM Profile and DURALUX Glass Beads™. “In cooperation with a key customer partner, the test deck for this system solution was installed on Highway 59 outside of Marshall, Texas, USA (4.70 miles south of Interstate 20), and consists of approximately 6000 linear feet of “6 inch, Yellow, Dot’n Line” on the North-bound edge line”, explains SWARCO REFLEX product manager Erik Maki. The AADT for this location is 861, a relatively low traffic area (estimated 25,830 to 34,440 vehicle passes for the 30 to 40-day observation period). The test deck was evaluated for initial retroreflectivity as well as 30-day performance after which the TXDOT SS8999 spec requires retro-reflectivity values (ASTM E1710) to exceed 250 mcd for yellow markings and 400 mcd for white markings. Initial average measurements resulted in 829 mcd/m2/lx, after 30 days retroreflectivity readings were still at 674 mcd/m2/lx. The use of SWARCO’s DURALUX Glass Beads™ in this application provides a more economical and durable solution when compared to 1.90+ high index or cluster type beads typically employed to achieve performance requirements. DURALUX Glass Beads™ can withstand more mechanical impact while maintaining superior retro-reflectivity for a longer period. Properly installed high performance markings from SWARCO not only provide drivers with well defined lanes of travel and more safety, but also allow contractors to adjust desired results when used in a double drop system (cost control).